One of the most influential soul singers of the 1960s, Otis Redding exemplified to many listeners the power of Southern “deep soul” — hoarse, gritty vocals, brassy arrangements, and an emotional way with both party tunes and aching ballads. He was also the most consistent exponent of the Stax sound, cutting his records at the Memphis label/studios that did much to update R&B into modern soul. His death at the age of 26 was tragic not just because he seemed on the verge of breaking through to a wide pop audience (which he would indeed do with his posthumous number one single “[Sittin' On] The Dock of the Bay”). It was also unfortunate because, as “Dock of the Bay” demonstrated, he was also at a point of artistic breakthrough in terms of the expression and sophistication of his songwriting and singing. Although Redding at his peak was viewed as a consummate, versatile showman, he began his recording career in the early ’60s as a Little Richard-styled shouter. The Georgian was working in the band of guitarist Johnny Jenkins at the time, and in 1962 he took advantage of an opportunity to record the ballad “These Arms of Mine” at a Jenkins session. When it became an R&B hit, Redding’s solo career was truly on its way, though the hits didn’t really start to fly until 1965 and 1966, when “Mr. Pitiful,” “I’ve Been Loving You Too Long,” “I Can’t Turn You Loose,” a cover of the Rolling Stones‘ “Satisfaction,” and “Respect” (later turned into a huge pop smash by Aretha Franklin) were all big sellers. 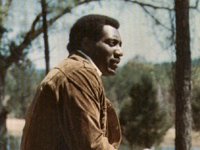 One of Redding’s biggest hits was a duet with fellow Stax star Carla Thomas, “Tramp,” in 1967. That was the same year he began to show signs of making major inroads into the white audience, particularly with a well-received performance at the Monterey Pop Festival (also issued on record). Redding’s biggest triumph, however, came just days before his death, when he recorded the wistful “(Sittin’ On) The Dock of the Bay,” which represented a significant leap as far as examination of more intensely personal emotions. Also highlighted by crisp Cropper guitar leads and dignified horns, it rose to the top of the pop charts in early 1968.